Lightpath is just over a year old but it quickly reached iconic status and feels like it has been part of the city for a lot longer than it has. As of the end of January, over 228k people had cycled along its magenta surface. But that surface is not as bright as it originally was, having been faded by the elements. It has also been cracking and blistering in places. To fix these issues the NZTA are closing this important connection for just over a week starting next Wednesday to fix it. Auckland’s Lightpath cycleway will get its own special sunscreen application next month, to protect it from the elements and make its colour even more vibrant. The magenta surface will be refreshed and UV protected as part of ongoing maintenance. The work means the shared path will be closed to all users between the 1st and the 9th of March. “This UV coating is marine grade and is used on cruise and container ships, so the paint surface will now live up to the harshest possible conditions and will be far more fade resistant,” says Brett Gliddon the NZ Transport Agency’s Auckland Highway Manager. The estimated cost of the refresh and UV protection is $115,000, which will be funded through money previously set aside by Auckland Council from the City Centre Targeted Rate. The UV coating will involve a base coat being painted on to the existing surface, which will look a little redder than the current surface, the final magenta top coat will then be applied which will create the vibrant magenta colour again. The work can only be carried out during dry weather and so the closure dates may be shifted. Very wet weather at the time the original surface was laid is believed to have caused some bonding issues with the existing surface which is made of recycled glass and this will be fixed during the maintenance work. This from Stuff shows the difference between the original surface and what it will look like after this work is done. I’m a little conflicted over this. On one hand I can appreciate that this work needs to be done and the weather narrows down when this can happen. But on the other hand, this is also the time of the year that is most conducive to cycling and closing it for over a week leaves people who want a safe, protected option for accessing the western side of the city without one. Can you imagine the NZTA accepting a motorway being fully closed for a week for works? It’s also disappointing that this needs to happen, why wasn’t weathering factored in when the surface was originally laid or were corners cut in order to get it open on time? Let’s hope the NZTA and AT get this work done as fast as possible and that there are no further delays. I have noticed all the black streets in Auckland have faded a bit since they were last sealed. The Council and NZTA should close them too and reseal the lot so they can be black again. You know what? They already do so every couple of years, whether it’s needed or not! Good thing they don’t do it on the footpaths though. Many of those have real heritage status now, they are so ancient. Some of the Auckland footpaths are in shocking condition, many renewals are happening in areas where the footpaths were still in good condition, meanwhile others are left to fall apart. Probably just another case of AT basing everything off data instead of getting out and taking a look themselves, there also seems to be a bit of picking and choosing. 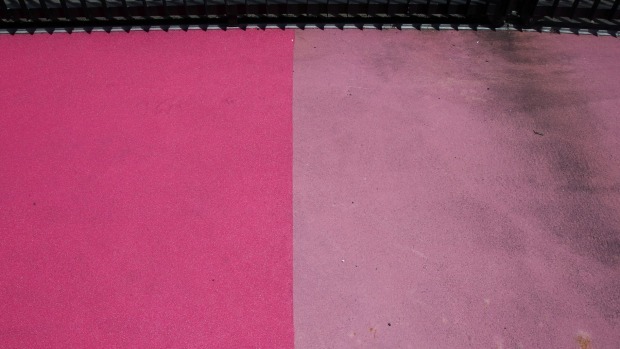 I am just gladdened to know the NZTA is so well funded and has no other pressing transport issues so it can spend money resealing a one year old cycleway because it is the wrong shade of pink. We are clearly now so flush in Auckland we can pick up poor NZTA’s bills. Bit hot in my office today, thanks for pointing that out. That is even better. Great to know that the Council has finished everything it has ever wanted to do and has made it right down its priority list to ‘make the cycleway a brighter pink’. What they cant claim this off the contractor or designer? Under the tender contract which was sent out to other contractors this required a warranty period which by looks of things, The contractor has made up a excuse as to why his product failed . Would it be practical to close off half its width at a time? Even more efficient to just close off half the height at any one time; less effect on cyclists. I agree, do half its width at a time. I am also suspicious why UV wasnt taken into account at the planning stage…its basic stuff… is there any accountability or do we just accept it???? because it is AT . In the private sector some one would be held to account !!! Why waste all that money?? Just let it fad to black again..
Can we get Mike Hosking to pay for it? I know how much he loves it. Although he might need the money to pay for jeans that aren’t full of holes. And yes, why was wear and tear and solar treatment not factored in when originally pinking it up? (I looked up magenta and it is not a defined colour, so even that shows lack of good decision making somewhere). Fortunately my bike is still out of order since a friendly motorist last ran me down on a zebra crossing and then sped off. It does show that cyclists are still about as wanted as Muslims in Trumpland. That’s what you get for not voting Chloe. A motorist ran you down while you were walking your bike across a zebra crossing? And drove off? No witnesses took his rego? Unfortunately not accurately. No serious damage to me, just another bent wheel. Your concern is appreciated! Exactly, NZTA manage to keep motorways open while doing maintenance work, I’m sure they can do the same for cycling routes too. Although this is a great piece of infrastructure, there is still a lack of consideration by AT as to how important this type of infrastructure is for the cycling community. Closing it fully will, in my case, seriously disrupt my commute into work. If they closed SH16 for even a day there would be uproar. I agree with the other comments on whether it could be done half at a time. Also, I understand that the reason the pink finish has failed is because it was done in a rush and a UV protective finish was not applied. I hope rate payers are not wearing the cost of this. Paint which is faded is COOL, High rise BUILDINGS are cool, Bridges Across the Harbour are cool/Beautiful, Narrow Streets are cool, Marinas are cool. Please Auckland Update your perceptions into a modern era… Beauty is in the Eye on the Beholder. Which is frankly a relief in Auckland. Auckland doesn’t get hot! It does get humid, though. But really, I can’t imagine many major cities with cooler summers than Auckland. London, Dublin and Vancouver. You’re right though Auckland isn’t hot really – I could only think of three. The sun is like a laser though, and with the humidity it usually feels a lot hotter than the air temperature would indicate. I’ve found low 30s in southern Europe to be more comfortable than mid 20s in Auckland. I’m actually really interested to see how much effect our extreme UV exposure has on perceived temperature. Southern Europe I can comfortably walk in the sun all day in low 30s, I can barely manage half an hour in 25 degrees in Auckland. I agree, Auckland’s combination of humidity and strong sun makes it feel about ten degrees more than it is. Interesting. I noticed yesterday here in Christchurch that a lot of newly laid green coating is already cracking and peeling. Wonder if there is a bad batch of ingredients, or incorrect info about laying technique, or something systemic like that. Ooh, curious; whereabouts? Generally I’ve found the coloured chip and other treatments to be infinitely better than the old painted approach, and the colour has lasted well. One positive is that at least it’s done just before March Madness! Can someone please explain why This is been again paid for by the city or NZTA as clearly the system used failed ad should have been under a contractors warranty as per tender document conditions .. Or are we been subject to favoritism towards the contractors excesses as to why his product failed in not only colour but adhesion in places to the surface ….. I think I may prefer the soft pink…. ?! Me to. A bit of faded denim, really. Softer to the eyes, not as garish. Feature not big. Not a bad call, the hot pink is bloody harsh on the eyes. I see you are no closer to getting your full stops in the right place. What do i say apart from that is me . Now come on guys. Too be fair, NZTA don’t have a lot of experience with cycleways. This mode if travel is quite new to them. It’s a learning curve. The bus lane green coating blisters and fades too! I haven’t personally noticed any problems with the pink section of the lightpath, but there is definitely serious blistering and missing chunks of coating on the beige section which is fairly narrow. I think this is why the lightpath needs to be closed completely…because the beige section is realistically too narrow to only do half at a time…it would be like trying to replace a footpath only half at a time. Red footpaths were an Auckland icon. Check out Garnet Rd Westmere. Red chip from Karamuramu Is. off Kawakawa Bay. Used to be all over inner burbs. Bring back the Pink! Actually I can imagine NZTA closing the motorways because you should try using them at night, its a lottery, especially tbe North western. Not for a week, I realise. And don’t forget to mention the fiasco that is the years of road works at Te Atatu and Edmonton Rds closing large parts of those very busy important roads permanantly. Is it just me or are you all blind to see what is happening here .I contractor goes and quotes a job which has a defects liability (warranty)period .And he gets paid for the works he has completed .The some months latter the works fail while under the defects liability (warranty) period .Under normal circumstances the contractor is required to come and fix said works under warranty at his cost. In this case this has not happened what we see is the contractor is charging who eva $115,000 to fix his problem(Failed works) citing he did not have time to put a UV coat over the job .This contractor has never placed a UV coat over any of his works in the past . Can they add a few furnitures while they do this? If I am walking instead of cycling, I would prefer a few resting spots, as the cycleway is quite long to walk. For example some chairs, and a few shading plants would be apperciated. They cut corners to meet their scheduled opening date. You’re blaming Bike Auckland who had nothing to do with the actual physical implementation of this work? Id be interested in the total path cost. I haven’t been counting properly but, I’ve seen about ten people use it over the last 2 months so it must be about 50k per year per user, like the new SH1 footpath in Warkworth.